BRIGHT TOUGH SUPER COMFY CHEERY BLUE/WHITE WITH YELLOW TRIM Rockin' Rider Trotter Baby's First Rocker - Padded Seat Cushion Mesh Fabric Is Removable And Washable For Added Convenience! 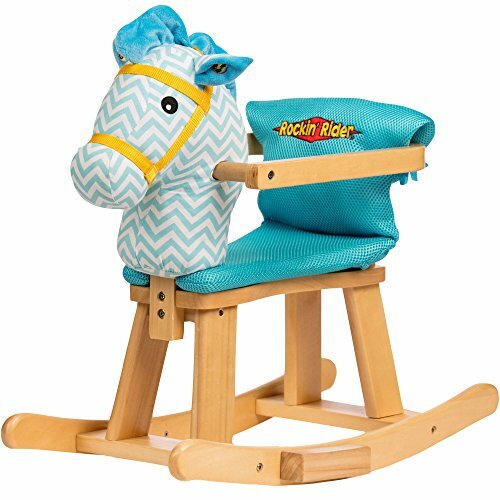 The Baby's First Rocker from Rockin' Rider features a sleek and modern natural wood design complete with a soft stuffed horse head. The padded seat cushion is made of cool, breathable mesh fabric and is removable and washable. View More In Rocking & Spring Ride-Ons.